The time has come to announce the HockeyBookReviews.com Top Ten Hockey Books of 2008. 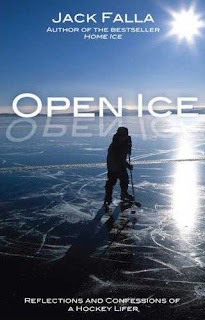 Open Ice is a brilliant collection of heartwarming and witty essays about hockey. The brilliance of the book is the author's effortless ability to make each individual essay flow from one into another. He accomplishes this using highly personal and reflective look back at hockey and of life. Each essay is part of the author's personal journey. The late Jack Falla was truly one of the few literary gems of the hockey writing world. Through Falla's journey we learn that the key to learn about hockey, but more importantly about life. As the Montreal Canadiens embarked on their centennial season, it comes as no surprise that 2008 saw a number of titles about Les Habitants hitting bookstore shelves. Though all the Habs titles are worthy of your consideration, Jenish's 100 Years Of Glory has emerged as the choice of critics and buyers alike. 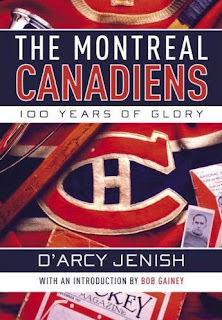 By doing so Jenish captures the true history of the Montreal Canadiens, warts and all. And he does this all largely through the work of the talented newspaper writers of yesteryear. I really, really wanted to give this book top billing. But I still have yet to read the whole thing. "Poems," as I call it, is just that. Nearly 200 pages and over 70 individual pieces of poetry about the life of Terry Sawchuk that combine to create one long, narrative piece of literary beauty. Yes, poetry. Hockey books don't tend to rank as literary gems because they're not intended to be. Almost without fail they follow the same formulaic approach, to appease the supposed lower end of the reading public spectrum. The stereotype of a hockey book reader is of the "dumb jocks" theory, more likely to read Slash's autobiography or Hitman by Bret Hart than to read Eckhart Tolle's latest contribution to Oprah's Book Club. This is a book that will undoubtedly win countless of industry literary awards and should go down as one of the best hockey books of all time. It tests the reader like me who is not well versed in poetry. I openly admit to having trouble reading the whole thing, but I know a great hockey book when I see one. 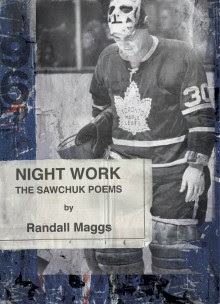 Night Work is a great hockey book. #4. Win, Tie or Wrangle: The Inside Story Of The Old Ottawa Senators - Paul Kitchen's Win, Tie, or Wrangle is the best kept secret in hockey books in 2008. I did not even know it existed until a couple of weeks ago myself. Incredible research and expert writing. #5. The Meaning Of Puck: How Hockey Explains Modern Canada - Author Bruce Dowbiggin suggests hockey is perceived to be "a window into our very soul." The award winning sports broadcaster and journalist looks at Canada as seen through the fascinating and sometimes contradictory lens of hockey. #6. Slap Shot Original - This is just a fun read about the real hockey career and life of the man best known as one of The Hanson Brothers of Slap Shot fame. He had more bizarre moments in his career than his movie alter-ego could even imagine. #7. Honoured Canadiens - A beautiful coffee table book featuring imagery that only the Hockey Hall of Fame could provide. Andrew Podnieks does a great job featuring each of the Montreal Canadiens players, coaches and builders enshrined in the Hall. #8. Saving Face: The Art And History Of The Goalie Mask - Though it is partly an encyclopedic history of masks, this book is judged as a coffee table book filled with amazing imagery. All the masks are here, from the most historically important to the most colorful and bizarre. #9. Don Cherry's Stories And Stuff - I think any grade 11 English teacher would have to flunk this book, but the unique approach only adds to Cherry's undeniable charm. Cherry's gimmicks work, and sell. This is the runaway best selling hockey book of 2008. #10. Habs Heroes: The Definitive List of the 100 Greatest Canadiens Ever - Who is the greatest Montreal Canadiens' player of all time? The Hockey News put together a panel to rank the top 100 players, just in time for their 100th season. Senior writer Ken Campbell then provides us with captivating features on each player. I always look forward to this list Joe, thanks again!